Here I go again making boxes and crates. For this project began with shims from the hardware store. I glued 2 shims together (thin end to fat end) to make a stronger slat. I used a piece of distressed wood on each side of the crate and glued 2 slats to the bottom, and 2 slats to each side. On the bottom I stapled square wire which I aged to look old. For a handle I used a piece of the metal strap from around an old barrel and nailed it to each end of the crate. 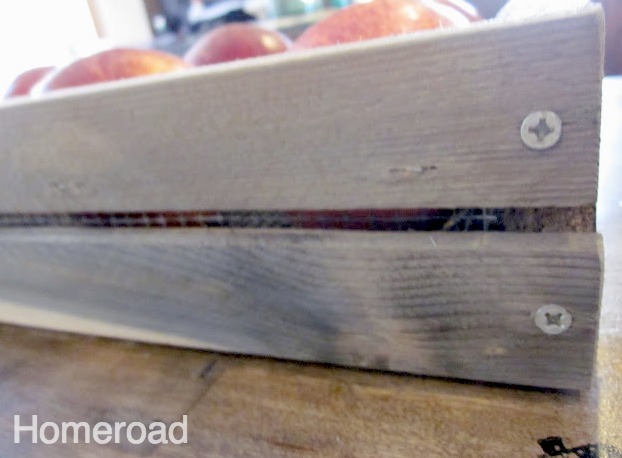 It makes the perfect crate for apples and fall decorating. Real cute...how did you distress the wire? Love the leather strap. In a pinch, one could use an old belt. It does, Susan! It looks like an old crate! You are so creative and I'm sure you'll be able to use it in the coming holiday months, too. I just love that!! Thank you for sharing it with us! I love the crate, Susan! 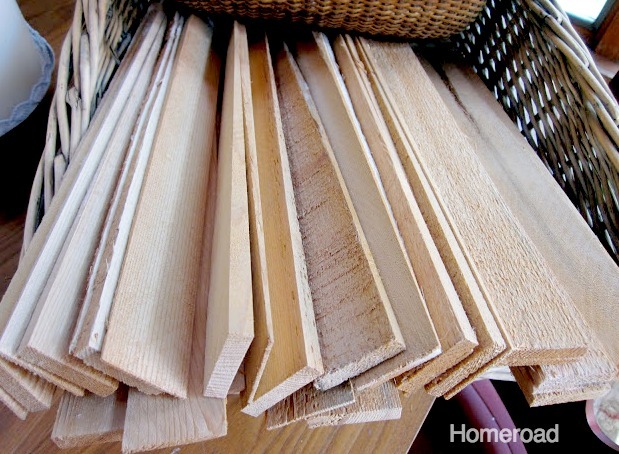 What a great use for shims! I'm heading to Home Depot today! This would be an inexpensive and fun project to do with a group of friends! You always have such great ideas! I've been thinking of you and your recent injury - how is your ankle? The only good thing about this is it's extending your summer and project time! Hope you're healing up well! Very cute! Hope you are feeling better. Oh you clever, clever girl!! I love this idea! You are the queen of crates!! I'm going to try this one, thx for sharing. How Creative! I Love it! It does look like an old crate! Thanks for sharing! Susan, what an awesome project. I love the wire in the bottom of it. I think even I could make this. Super job! OH MAN!!! I am SO in LOVE. I need to make one. SO CUTE, MUST BE PINNED! I absolutely love how that looks! Just found you on Amaze Me Link Party... Like your blog, and really enjoyed this post. 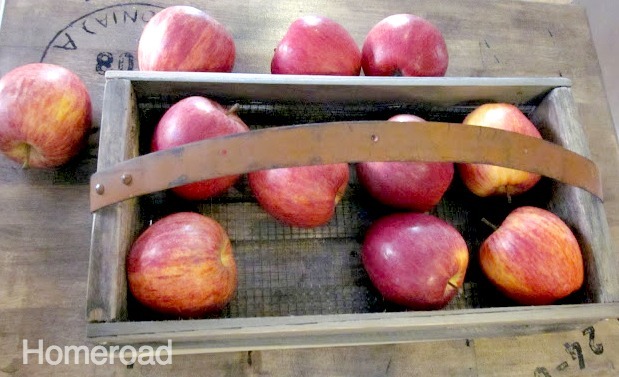 The apple crate looks great...especially the wire on the bottom. Great Photographs as well! Now that's really clever. So glad you linked up this project. I am always attracted to your projects on these linky parties! Good job, again! So fabulous!! The kids and I are hoping to go apple picking on the weekend. I would love to have one of these!! THat handle totally makes it. Thanks so much for linking up to The Creative Spark. Have a great week! Love it!!! I am looking for your follow button so I can follow. How creative! The leather strap really lends to it's vintage look! My eyes deceive me, the metal strap sure looks like leather! It's terrific! What a creative, unique idea. Would be perfect in my apple country, wa home. Thanks for the inspiro! Awesome idea..Great creativity...I found ya per blog hop and had to stop in and say hello..Officially following ya via http://theartsygirlconnection.blogspot.com ..Hope you can stop by too :)) .Ty..
thanks for stopping by my blog...I had to sneak over. Glad I did! Love this crate...simple and cute! I love it--that handle is divine. Thanks for sharing at Beyond the Picket Fence! Great looking apple crate! You're so creative to think of using the slats in this way. Very rustic and Fall-ish. I hope you don't mind, but I pinned your fabulous crate in Pinterest. It looks amazing. Awesome! Thanks for linking to the party this week. I'll be featuring this Sunday! Just popping back to let you know that I will be featuring this tomorrow at Clean and Scentsible. 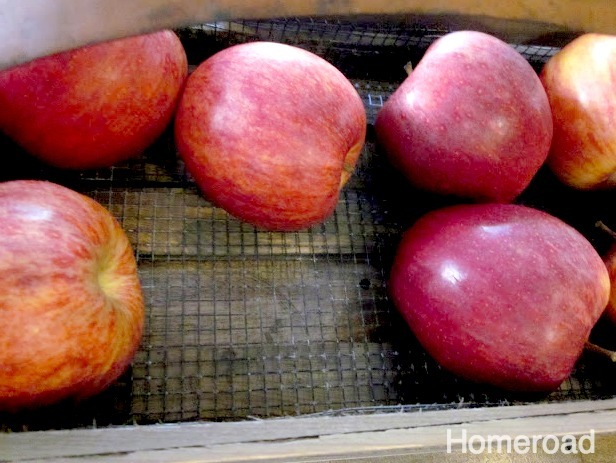 Just went apple picking today - I would SO love to have one of these!! I so need to make some of these! Especially that you made them out of shims! Thank you for sharing at Simply Creations Link Party! Susan, How very creative and I love the crate. Thank you for linking to the Open House party. I see so many old crates that I love put the usually carry a large price tag so this is such a great tutorial. :) Thank you! 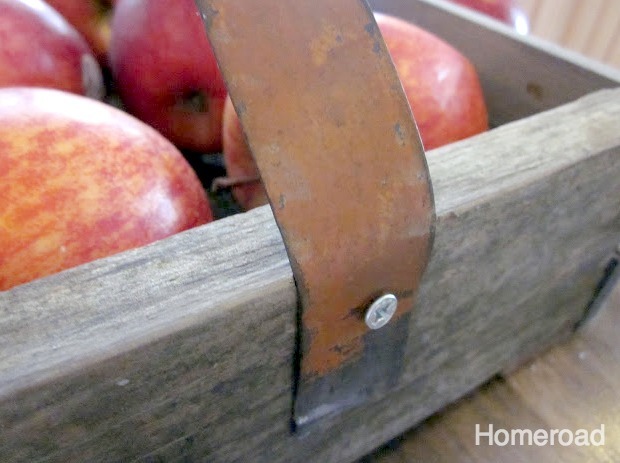 I love old crates too- and with the apples- so charming! Thanks for sharing at Feathered Nest Friday!